How to Purchase Diamonds in South Africa? South Africa is renowned for its exceptional diamonds, both colourful and perfectly clear. That does not mean that finding a good deal is always easy, however. The best diamond deals ultimately arise from well-informed decisions. Cape Diamonds is here to help make the process easier, allowing you to make an educated decision before you purchase diamonds in South Africa. First and foremost, the most important thing for you to consider is the diamond certificate. All South African diamonds require a certificate from a laboratory that has analysed the stone carefully to first determine whether it is indeed a natural diamond and then determine the inherent value of the stone. The value is clearly stated on the certificate and is defined by the size and quality of the diamond. Quality is determined by colour, clarity and cut. Unfortunately, a challenge faced all over the world is that not all laboratories grade diamonds to the same standard. Some labs create certificates that over-estimate quality of the diamond, over-valuing the stone in the process. 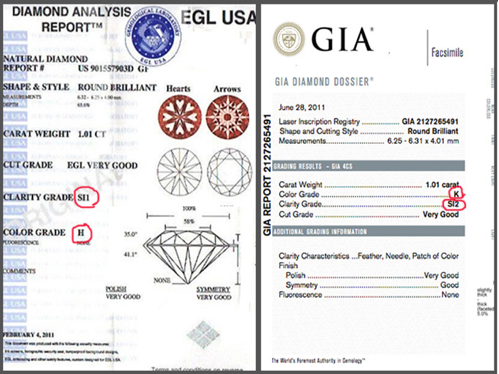 To show how easily this can happen, we sent a diamond certified by EGL USA to GIA South Africa. The shocking truth is revealed in the certificates below. EGL USA graded the diamond colour H and clarity SI1. GIA South Africa, meanwhile, graded the diamond colour K and clarity SI2. EGL USA over-valued the diamond by 50%, turning a good deal into a very bad deal! 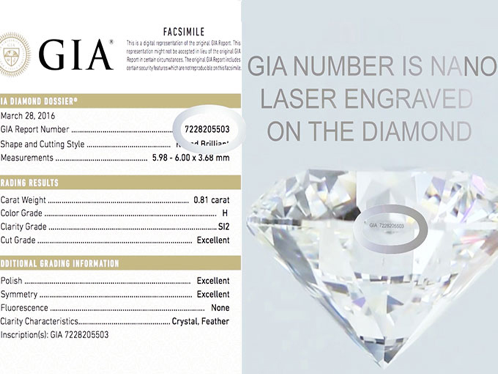 GIA (Gemological Institute of America) is the most trusted certificate in the diamond industry. This non-profit organisation is internationally known for its high-quality diamond grading laboratories that contain the most sophisticated equipment to ensure an accurate and honest certificate. All large, high-quality diamonds mined in South Africa should always be sold with a GIA laboratory certificate. Never purchase a diamond without a GIA certificate. If you do purchase a diamond without a GIA certificate, then it is essential to send it to GIA to make sure it is a natural diamond. All diamond dealers in South Africa are familiar with the GIA Laboratory. No reputable dealer would choose not to use a trusted certificate and instead make their own certificate. To understand the process of investing in South African diamonds, you first need a detailed understanding of the diamond certificate. 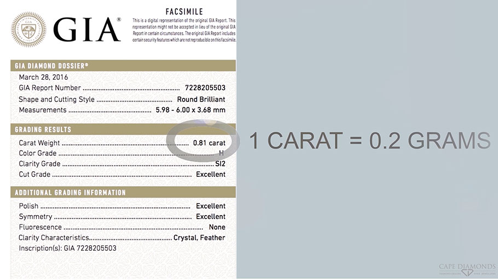 Each diamond certificate should contain a unique serial number that is unique to the diamond. This number can be verified on the GIA website at www.gia.edu. Always ask your jeweller to view the number under a microscope to make sure that the certificate number matches the diamond laser number. Ask your jeweller to make the number visible after the diamond is set in the ring so that it is always visible. This is very handy when taking the ring to be cleaned, as it allows you to verify that you are getting the same diamond back from the jeweller. Another thing to understand is the shape or cut of the stone. 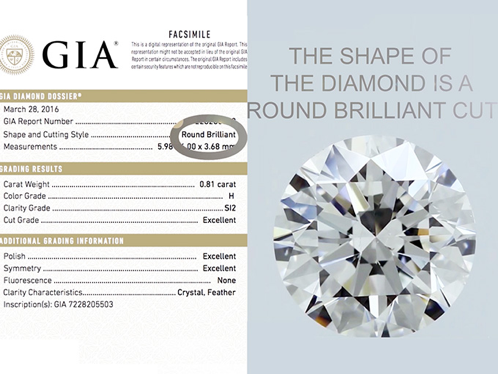 As you can see in the certificate above, the shape of the diamond shown here is a round brilliant cut. 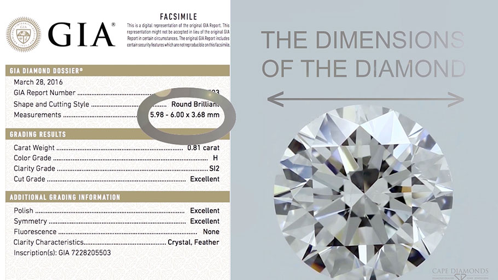 All round brilliant diamonds require 58 facets or surfaces to qualify, or 57 if the culet is not included. Diamond cuts affect the value of the stone according to demand, rough diamond shape, and brilliance of the polished stone. The most valuable diamond shape of all is the round brilliant cut gemstone. Some jewellers create hype around unusual shapes or specific cuts that they have patented. Unfortunately, these diamonds often have a reduced global resale value. To ensure your investment is safe, it is best to stick to one of the traditional shapes shown above. These cuts are ideal investments as they have a recognised, classic shape that is universally known. Before they are cut, rough diamonds are 3D scanned to determine a cut that generates the highest yield and value. Most rough diamonds form a natural pyramid shape. If the pyramid crystal shown in the image above is cut in half, the result is a pair of cushion cut diamond shapes. 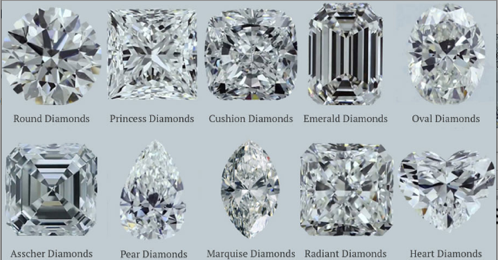 If the same diamond crystals were polished into two round brilliant cut gems, the result would be stones that are smaller than the cushion cut stones, as round diamond shapes have more offcuts. This is why cushion cut diamonds are more affordable than round diamonds. Cape Diamonds offers a number of well-priced cushion, princess, emerald, oval, Asscher, pear, marquise, radiant, and heart cut diamonds, thanks to the unique high-quality geometric crystal shapes found in Southern Africa. The certificate will show the dimensions of the diamond to the nearest hundredth of a millimetre. The relationship between height, width and depth is what determines the stone’s sparkle. The angles between various facets need to be exact to create maximum brilliance. 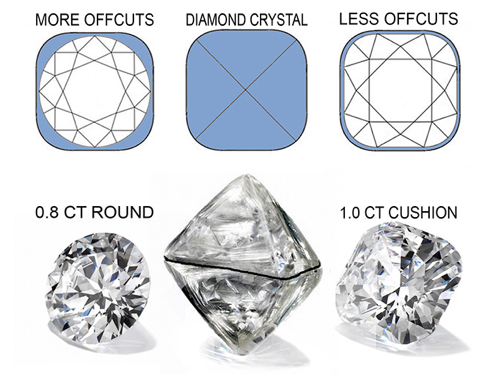 A perfectly cut round 1ct diamond should have a 6.5mm diameter. 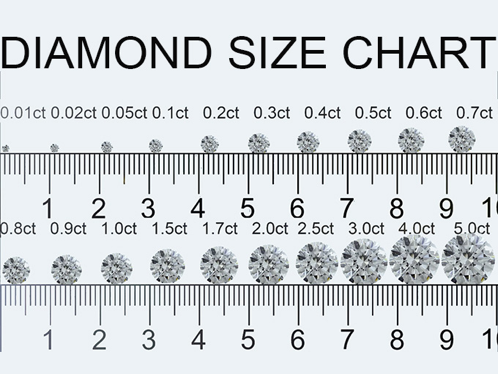 The chart below gives an indication of diamond sizes. The weight of a diamond is measured in carats. 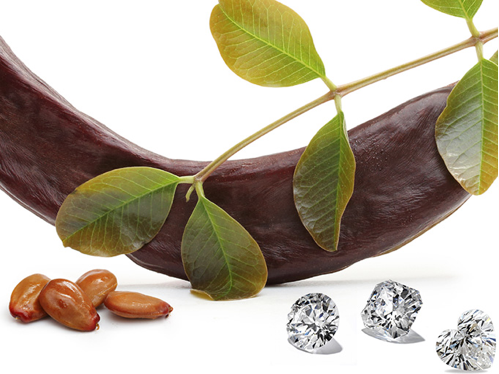 The word carat originates from the carob tree’s seeds. This plant is the same carob powder that is used to make chocolate and sweet treats. Known as carats, these seeds were used as a weight measuring unit on scales for trading gemstones and gold as they have a very constant size and weight. A single carob seed equates to 0.2 grams while 5 seeds equal one gram. The image shown here features a diamond of 0.81 carats or 0.81ct. When a diamond weighs less than 1ct, it may be described in points or hundredths of a carat. This diamond may, therefore, be called an 80 pointer, and, similarly, a half carat might be known as a 50 pointer. A diamond’s value increases exponentially with size due to the rarity of larger diamond crystals. South Africa is known for producing the largest clear diamond in the world – the Cullinan Diamond. This mesmerising gemstone is owned by the British royal family and is called the Great Star of Africa. When it comes to diamonds, size does not always matter, as long as the diamond is visually perfect to the human eye in terms of colour and clarity. Diamond colours are graded from D to Z. Stones graded at D are colourless and stones graded Z are yellowish. 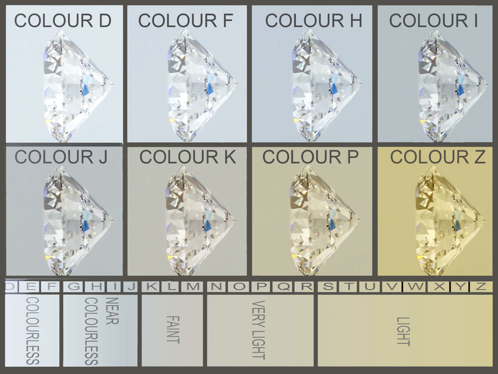 The reason that there are no A-C colours is that when the colour grading system was created, room was left for clearer diamonds that may be discovered in the future. No clearer diamonds than the perfect colour D gemstone have ever been discovered. 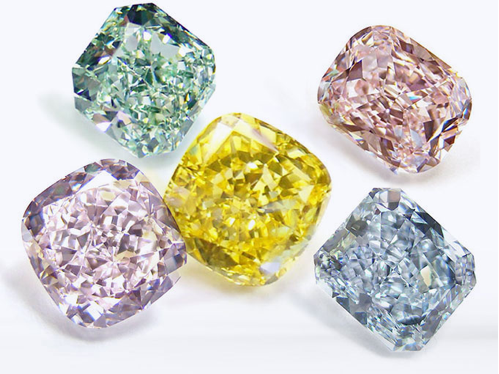 The best diamond colours for investments range from D to I. These are diamonds that fall into the colourless and near colourless ranges on the GIA diamond chart. They appear white and transparent to the human eye and set beautifully in platinum and white gold jewellery. Colour J falls in the near colourless range but has a very slight yellow tinge. It is best to only use J and K coloured diamonds in yellow or rose gold, as the metal colour hides the yellowness of the diamond, complimenting the metal’s warm nature. South African diamonds generally have high colour quality due to the purity of the elements found in the carbon crystals. Diamond clarity ranges from Internally Flawless (IF) to I3. IF stones have no internal imperfections, while I3 resembles a broken mirror. Clarity is determined by the ability to see imperfections under magnification. Diamonds ranging from IF to SI2 are considered visually perfect to the human eye. Some SI2 diamonds have visible inclusions when diamonds are larger in size or the inclusions comprise a single black crystal in the middle of the stone. Cape Diamonds sorts through many SI2 diamonds, selecting only the best eye-clean stones. IF-SI2 diamonds sold by Cape Diamonds are great investments, as they all look the same to the human eye. 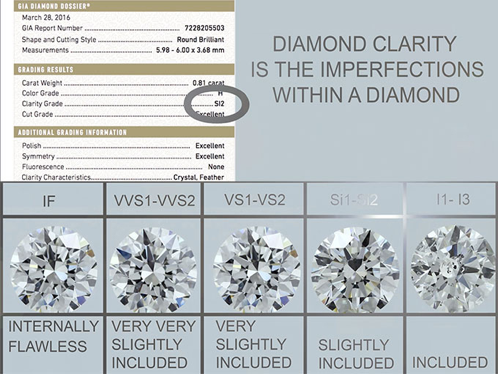 Flawless and VVS diamonds are more expensive and look identical to VS and SI stones. We recommend choosing VS and SI diamonds to save money or investing in a larger diamond instead. VS and SI diamonds are more popular in South Africa and have a greater resale value than Flawless and VVS stones. Never purchase a diamond with clarity less than SI2, as the diamond will have visible marks and zero investment potential. Some clarity and colour combinations work well together; others do not. There is no point selecting a graded L-Z coloured Flawless diamond or a D coloured stone with visible flaws. Generally speaking, the lighter the colour, the higher the need for clarity. D coloured diamonds are the only diamonds that can be paired with Flawless clarity stones for the ultimate investment. These perfect characteristics are rarest in stones over one carat. When stones are under 1ct, it is often pointless pairing D and Flawless, as most would prefer a larger diamond rather than D Flawless. It is better to pair D coloured diamonds with VS1 or VS2 clarities, as they look as perfect as D Flawless diamonds even to the trained eye. E-I coloured stones are best paired with diamonds of VS1 – SI2 clarities, depending on your budget. Make sure no black crystals appear in the table of the diamond if you purchase an SI2 stone. At Cape Diamonds, we sort through many SI2 diamonds, selecting those that we consider visually clean. It is essential to view the diamond under magnification to spot imperfections before you select a defective diamond. If purchasing online, you can ask for a photo or you can ask the jeweller for their input on the inclusions. J-K coloured stones are more affordable and are best paired with SI2 stones to maximise size. It is best to avoid L-Z colour and I1-I3 clarity diamonds, as these have zero resale value. Fluorescence is a diamond’s ability to emit a soft blue glow when viewed under ultraviolet light. On average, 30% of diamonds have fluorescence. 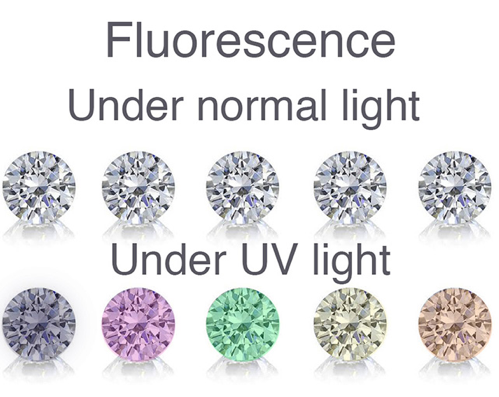 Almost 95% of all fluorescence found in diamonds is blue but other colours such as green, orange, yellow, red, white, and purple can also occur. Fluorescence can be faint or very distinct. It is graded in categories: none, faint, medium, strong, and very strong. This image shows how different coloured fluorescence appear under UV light. Note that these colours are not visible in normal light. Fluorescence occurs when fragments of an element that reacts under UV light are absorbed by the diamond while pressurised under the earth over several million years. These elements are drawn into the composition of the stone, causing an array of colours as well as fluorescence as the diamond develops underground. Even though the chemical structure of a diamond contains only carbon, it is possible to find traces of other elements such as aluminium, nitrogen or boron. The mixture of nitrogen and aluminium create a blue fluorescence, a nitrogen atom will create a yellow fluorescence, and two nitrogen atoms will create green-yellow fluorescence. HOW DOES THAT AFFECT THE DIAMOND? Fluorescence is not visible under normal light and can sometimes improve the colour of the diamond, especially in H, I and J colour diamonds. Diamonds with an extremely high fluorescence may appear less clear, however, this does not occur in diamonds with a medium or faint fluorescence. 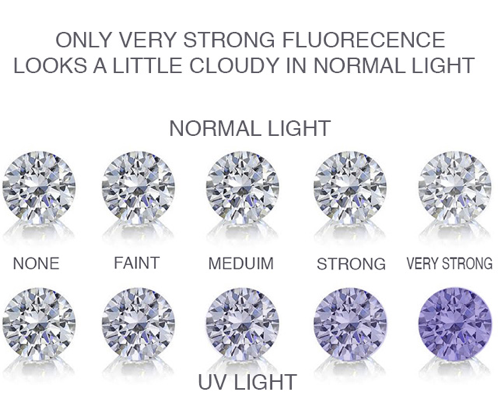 Strong fluorescence is virtually undetectable even to the most experienced diamond dealers. Very strong fluorescence can be seen in direct sunlight and it should be avoided. This image shows fluorescence in diamonds under UV and natural light. Fluorescence in a diamond can be used to your advantage. Diamonds, which lean towards yellow in colour, can appear whiter. This is because the blue glow contrasts with the yellow hue in the diamond, resulting in the two colours cancelling each other out. Fluorescence does not affect the structural integrity of the diamond and is not something that will greatly change the overall look or value of your diamond. To the naked eye, fluorescence is not visible.